Discussion in 'Flower Gardening' started by Jewell, Dec 21, 2014. We continue to have warm, drier than usual weather. The heather blooming in the snow is always a cheery little sight, but we haven't seen any snow near the Sound. The pinks are always the first to show colors but the whites will following soon. 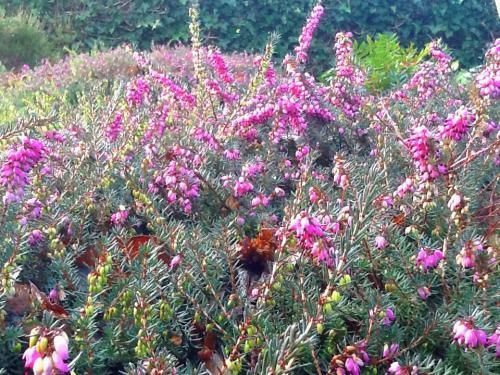 Heathers always provide little bit of winter color in the garden. Cayuga Morning, Gail-Steman, Frank and 6 others like this. Wow, those are beautiful! It's so drab here right now that your colors are most appreciated Jewell. They must look stunning blooming thru the snow! I love to have that growing in my back yard. Really pretty. Sure is nice to see some colors. Very pretty! I do love the heathers and my front yard has one variety or another blooming through most of the year. 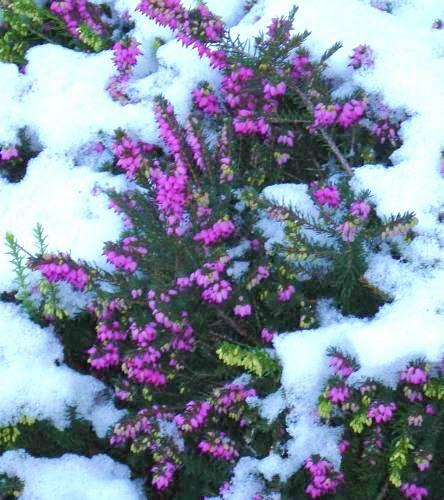 From years past here is a photo of heather blooming in the snow. Makes winter feel like spring even on the darkest days. Gail-Steman, Frank, Tooty2shoes and 1 other person like this. Very pretty and what a joy to see color in someones yard because my flowers are all brown and some cut back. 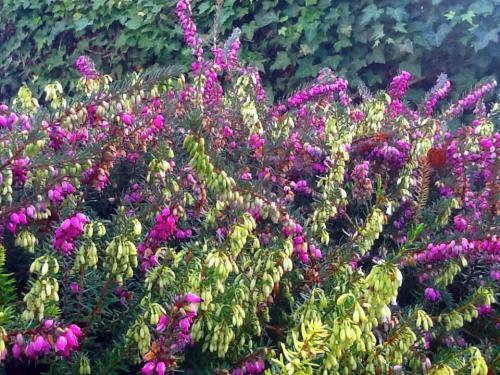 @Jewell, Your heather is a gorgeous delight to view. My winter heathers still going strong. Cayuga Morning and Petronius like this. @Gail-Steman, I like how there is some white and purple together in the same heather. Well there's supposed to be lilac besides but it's like the white and purple have mainly took over. @Gail-Steman, Lavender is a shade of purple.